How Low Can Pot Prices Go? Contrary to what many claim, prohibition raises drug prices enormously. 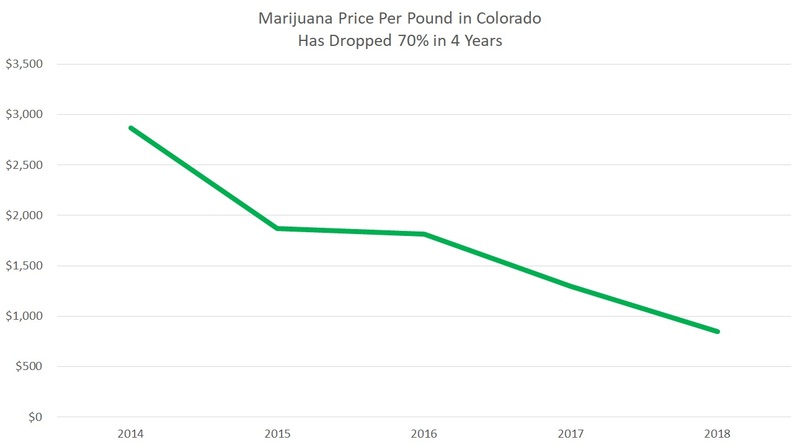 Conversely, legalization causes a price collapse, which in addition to increasing drug use also means that ad valorem taxes bring in less money per sale month by month. States that set cannabis taxes as a percent of price are thus not going to get the revenue they expected and indeed could end up subsidizing the marijuana industry out of the public purse. Details at my latest Washington Post Wonkblog. Author Keith HumphreysPosted on November 18, 2018 November 18, 2018 Categories Drug PolicyTags marijuana legalization1 Comment on How Low Can Pot Prices Go? A number of correlational studies have shown that at the individual level, cannabis use is positively associated with opioid use, misuse, and addiction, whereas at the state level, availability is negatively associated with opioid prescriptions and overdose rates. Many people have responded to this ambiguous situation by asserting that the correlations which fit their marijuana politics represent rigorous causal evidence and those that don’t are just correlations, nothing to see here, let’s move on. Assuming you actually wanted to know the answer about whether cannabis and opioids are substitutes, and saw science as a tool to learn things rather than prop up your ideology, what would be a rigorous way to test the question? Experimental designs are tough to implement because of the ethical issues surrounding introducing people to addictive drugs. However, my colleague Beth Darnall and I lay out a strategy in the current issue of Addiction that doesn’t present this ethical quandary. Millions of people are taking prescribed opioids long-term and many of them want to reduce their dose or stop taking them entirely. Tapering protocols have been developed to help such people. Critically, a significant number of these people also use cannabis. This presents an opportunity: Run a randomized clinical trial on such individuals who are interested in tapering opioids and also measure what happens to their cannabis use if their opioid use changes. Beth did this is a small tapering study which didn’t have the power to assess effects rigorously but demonstrated proof of concept (FWIW, three people quit marijuana use, all of whom had also quit opioid use). With support from PCORI she has now launched a much bigger study in which this question can be addressed within a multi-site randomized trial of opioid tapering. This isn’t the only route to pushing the science in this area. Ziva Cooper at Columbia is doing inventive experiments on the interaction of opioid use, cannabis use, pain, and drug liking. It’s an intriguing area and good science will out, even if only a minority of people are willing to accept the results whatever they are. As one would expect in an era of increased legalization and decriminalization, court referrals to marijuana addiction treatment are dropping like a stone. But for a reason that may surprise you, the number of people seeking marijuana addiction treatment is not going down overall. To find out why, see my latest Washington Post Wonkblog. As states struggle with what to do about marijuana impaired driving, a new study from Johns Hopkins University makes things even more complicated. Study subjects consumed cannabis by eating it rather than smoking it, after which the research team assessed whether grossly impaired subjects would meet the legal standard of 5 ng/ml of blood THC. The results were both surprising and disturbing, as I explain in my latest Washington Post Wonkblog. For more on coming collapse marijuana tax revenue, see my latest piece at Washington Post Wonkblog. Attorney general nominee Sen. Jeff Sessions (R-Ala.) is a fervent foe of marijuana legalization. But if he were confirmed as President-elect Trumpâ€™s top law enforcement official, would he really have any power to put his anti-pot views into practice? To find out, read my latest piece at Washington Post’s Wonkblog. Cannabis ought to be legal. Prohibition has broken down to the point where the harms associated with trying to control an illegal market generating $40 billion a year in criminal revenues greatly exceed the benefits, and there’s no plausible route back to effective prohibition. We ought to legalize in a way that makes moderate use by adults easy, while discouraging the formation of bad cannabis habits (an increasingly common problem) and use by minors. Alcohol-style legalization, which is what the ballot propositions generally offer, is a bad way to do that, because a for-profit industry (like the existing illicit industry) will make most of its money selling to heavy daily users rather than casual users, and about half the daily users – by their own self-report – have lost control of their cannabis habits. There are lots of other, better options. Even within a for-profit model, there are plenty of ways to encourage temperance, starting with keeping prices high, restricting persuasive marketing, and requiring that sales clerks have training in pharmacology and the prevention of substance use disorders and a professional responsibility to give advice in the interest of their customers, not their employers. It would therefore be better to handle this through the usual legislative process rather than by initiative. To make that workable, Congress should act to allow states to legalize (waiving the federal criminal laws that would otherwise apply) if their plans to do so meet rather strict criteria, as determined by the Secretary of HHS and the Attorney General. Those waivers should have to be renewed periodically, in order to hold the states and the industry to the promises made in order to get them. But since the state and federal legislative processes clearly won’t do what a majority of the voters clearly want them to do, I’d vote for any halfway-reasonable legalization initiative, both to end the arrests sooner rather than later and to nudge the legislators along. So, going in to the discussion, I was prepared to advise Arizona voters to hold their noses and vote “yes.” Â That’s the same advice I’d give voters in California. But clearly there are some propositions that are so bad, and so hard to fix, that the voters ought to reason the other way: vote “no” to encourage the advocates to come up with something less awful. My conclusion, after participating in the discussion, is that Measure 205 is bad enough to warrant that treatment. Jonathan Caulkins once described the debate over cannabis policy as “a Whole Foods discussion of a Walmart situation.” The graphic below illustrates his point: most of the days of use involve people with a high-school education (the purple band), high-school dropouts (the green band) or people under high-school graduation age (the red band); the people in the discussion mostly have college degrees (the orange band) if not more. Keith Humpheys reflects on the implications of that situation. Although education is not a perfect proxy for income, the fact that 85% of pot is consumed by people who didnâ€™t graduate college makes clear that marijuana is mainly consumed by people in working-class and poor neighborhoods, not in the kinds of places that economists, attorneys, policy analysts, journalists, physicians and politicians tend to live.Â A major challenge therefore for the legitimacy of marijuana policy is to ensure that people outside the college educated bubble gain more voice in the ongoing political debate. The Mexican Secretario de GobernaciÃ³n (roughly, interior minister), Miguel Ãngel Osorio Chong, gave a fascinating talk as part of the formal national debate over cannabis policy that followed the Supreme Court decision affirming a personal right to consume the drug. The striking Â thing about the speech was its recognition that both prohibition and commercialization have unwanted consequences, and its hint that Mexico might be alert to the possibility of finding an approach to avoid both sets of dangers. Of course no one who has been doing drug policy for more than about twenty minutes is ever truly optimistic that a government will find something intelligent to do when there are so many unintelligent alternatives, but watch that space. The official Spanish text of the speech is below; unofficial English translation here. Author Mark KleimanPosted on March 25, 2016 March 26, 2016 Categories Drug PolicyTags cannabis, marijuana, marijuana legalization, Mexico, Miguel Ãngel Osorio Chong1 Comment on Smart legalization in Mexico?